The Internet of Things, Industrial Internet, or Industry 4.0 – call it what you will, but all of these terms can be summed up simply as “The use of networked technology to increase profits in a data-driven economy.” While it’s clear that the IoT of Fitbits and Nest thermostats doesn’t translate completely into that of wind turbines and jet engines, the concept of capturing information to influence future business outcomes remains constant. Digital twins are a manifestation of the cyber-physical world of IoT that create a virtual representation of individual physical systems deployed in the field. These engineering models are designed collaboratively by software architects, materials scientists, and hardware designers to create precise digital replicas of individual, real-world assets. These replicas are then continuously tuned and updated based on the history of and events experienced by a particular system, which is paired with its twin by serial number. 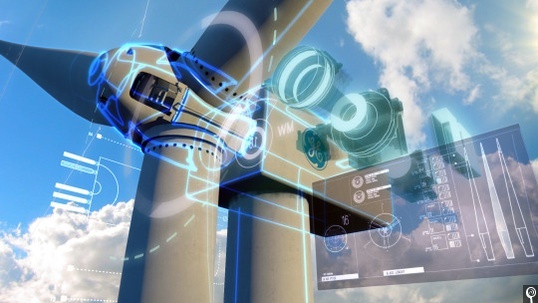 For instance, the digital twin of a wind turbine would account not only for the system’s total hours of operation, operating conditions, and limitations of the various components that make up the actual machine, but also use that information to project into the future for system optimization. If there are adverse weather conditions on the horizon, the digital twin can be used to simulate how the turbine’s gear box, controller, generator, and yaw drive must be set to maximize energy production without risking damage to system components at certain wind speeds. Digital twin models can also be used to deliver meticulous data about exactly what components require inspection, and when specifically. The ability to pinpoint the service of a jet engine, locomotive, or any industrial system where downtime equals lost revenue, in turn also means maximized revenue. This goes beyond the realm of predictive maintenance and into precision maintenance. All of the data regarding repairs, environmental conditions, lifetime performance, etc. is repeatedly realized in updated iterations of the digital twin, much like your personal profile on iTunes or Amazon continuously evolves over time. However, these capabilities are not the most intriguing possibilities enabled by a digital twin. Consider the IoT at its most valuable, where, as Parris puts it, networked industrial machines publish content that is of interest to other networked industrial machines. Going back to the wind turbine example, a newer turbine in a wind farm may detect anomalies that it has never experienced before or is unfamiliar with. These could be related to performance, environmental conditions, or perhaps even a potential security vulnerability that the new machine is ill equipped to handle. In this scenario, the new turbine would be able to query other nearby turbines for information about a particular anomaly – their historical analytics, as well as system updates – and adjust its settings and behavior accordingly. However, because the new turbine is unique from the other turbines it has requested data from – operating with its own components at various stages of their lifecycle, perhaps in a different orientation, and so on – its digital twin would use artificial intelligence and machine learning algorithms to compensate for status discrepancies included in the recommendations acquired from the new turbine’s counterparts. This offers the possibility for two services on the Industrial Internet. First, historical data from industrial devices can be published for use by other systems, perhaps even ones in different market domains that serve different end purposes. Second, because of the possibility that relevant data could be of use to dissimilar systems, there will be a need to translate that data into various appropriate formats. The platform that enables this data exchange marketplace is GE Predix, a cloud platform-as-a-service (PaaS) software offering that is not unlike the app stores for mobile devices that we’ve grown so accustomed to. Here, a collection of analytics and runtimes are available from GE and other third-parties with systems deployed across a variety of industrial markets, and exposed to the community through a set of APIs. Paired with and industrial-grade operating system, Predix is a prosumer tool for the Internet of Things, something GE is all too familiar with. This is what the data-driven economy looks like on the Industrial Internet. For more information on Predix, or to register for a free trial, visit www.predix.io.